There’s an abundance of different road signs used around the world, some of which display crucial information and road laws which must be obeyed, others which are slightly less important and a lot more obscure! This month, we’re taking a look at some bizarre and weird road signs from around the world, and asking ourselves what on Earth they could mean. Forms of these warning signs popped up all over America not so long ago, and reactions varied between absolute horror and amusement. The stunt was pulled off by pranksters on many signs throughout Illinois and Texas, and officials were stumped as to how the jokers managed to hack the electronic road signs. 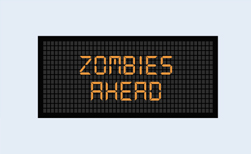 The Illinois Department of Transport did not find the hoax amusing, with one supervisory field engineer stating categorically ‘we don’t want drivers being distracted by a funny sign.” Hoax or not, we’d appreciate the same forewarning in the case of an actual zombie apocalypse! 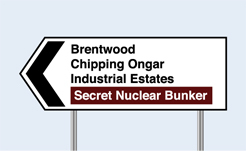 Those responsible for the road signage in Brentwood clearly don’t know what the word ‘secret’ means! In reality, this sign is referring to the Kelvedon Hatch Secret Nuclear Bunker which was a large underground bunker used during the Cold War. It was decommissioned in 1992, but it is still a big tourist attraction today. 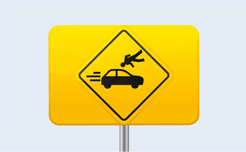 This sign that can be spotted all around Abu Dhabi in the United Arab Emirates creates some confusion, despite its best intentions to warn drivers of falling rocks from the hilly terrain that can seriously dent cars and chip windscreens. Until 2000 the pastures surrounding the Mauna Kea Access Road in Hawaii were completely open, meaning that cattle could wander across the road at any point. After many accidents involving unsuspecting motorists and stray cows soaking up the remaining heat from the sun-warmed tarmac at night, this sign was deemed a necessity to prevent any more cattle deaths and bumps in the night. However, from 2000 the Parker Ranch upped their security measures and fenced their cows safely in their pastures. However, the legend of the invisible cows still remains! This South Holland road sign is dedicated to a local deaf cat, with the sign warning motorists that this is a dedicated crossing for the cat so to be prepared as it may run out into the road or not hear them approach. Motorists should drive slowly and carefully, keeping an eye out for the much loved feline! China’s translation error does not make China look like the most tolerant of countries! 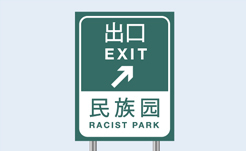 The signage was supposed to be directing tourists to the local ethnic museum, a much more pleasant and informative attraction, we imagine! Queensland, Australia certainly have some scary looking cows on the loose! Again, another pleasant warning to drive carefully around cattle is misconstrued in a weird and wacky way, with these demonic looking cows seemingly on the warpath! 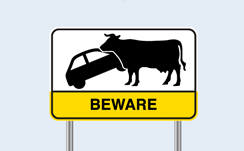 Cattle in the outback are often free to wander as they like, so this simple sign is just to warn motorists to keep the speed down and their eyes on the road. This is one of India’s many witty attempts to keep drivers’ speed limits under control, especially when navigating the hilly terrain of the country’s beautiful countryside. The beautiful city of Edinburgh is steeped in history, but the old and winding streets make crossing roads dangerous. This sign near Waverley Railway Station, however, looks more like it’s inviting motorists to partake in a game of chicken rather than warning pedestrians to take care crossing! Canada clearly take the care of their beautiful forestry very seriously! The forests in Canada are very flammable, and wildfires are a very real and ongoing problem for the country, with thousands of wild animals losing their habitats and lives a year. 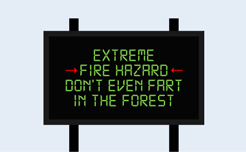 However, nothing seems to detract from the friendly Canadians’ demeanours, as shown by this funny demand to leave flatulence outside of the forest – you have been warned! 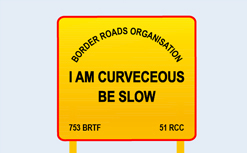 We hope you enjoyed this collection of weird road signs from around the world. 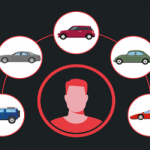 For something a lot more practical, The Windscreen Company are available 24 hours a day, 7 days a week, 365 days a year for emergency windscreen repair call-outs and advice. 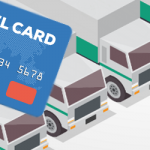 We’ve been operating throughout East England, including Ipswich and Essex for over 15 years so you can rely on us for a high quality, professional service. Get in contact today to find out more. 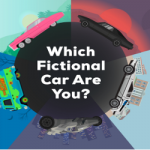 Which Fictional Car Are You? 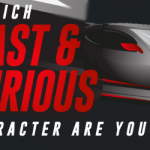 Which Character from The Fast & The Furious are You? 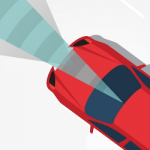 What is Windscreen Calibration and When Do I Need One? The Windscreen Company Celebrates 20th Birthday!